B2 "Southend Pier" is a pitched-down version of the opening of OMD's "Tesla Girls." A2 definitely Lets Me Feel It!!! . . . .
A2 is just so much fun . . . .
What a record ! A side gives us 2 timeless disco tracks that will make any dancefloor move. Future big disco classic. 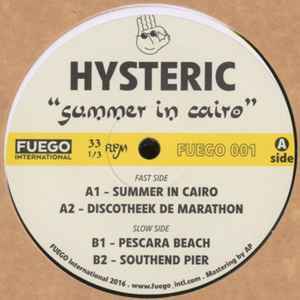 "Melbourne producer Hysteric is becoming a go-to man for those looking for killer re-edits of obscure, left-of-centre Italo-disco and synth-pop oddities. Here he serves up a fresh batch of reworked gems for new label Fuego International, following inspired outings on Bordello A Parigi and Public Possession. The title track is a steamy, exotic Italo-disco gem blessed with electrofunk flourishes and AOR disco guitars, while "Discotheek De Marathon" is a throbbing, synth-heavy chugger that makes great use of extended drum solos and synthesized cowbells. Flip for the sweet, Afro-Italo fusion of "Pescara Beach", and the pitched down, electro-influenced new wave shuffle of "Southend Pier"."